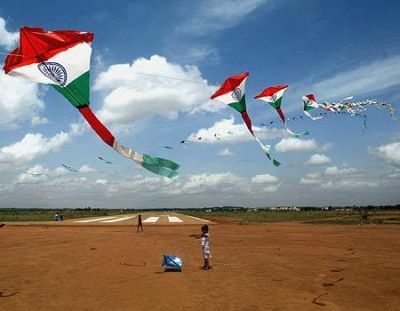 Kite flying on India Independence Day! I wrote it in July of 2011 about how we in the USA tend to refer to our Independence Day as “the Fourth of July.” Except for Cinco de Mayo, I don’t know of a country that just uses the date for a national holiday. Essentially, my point was that we tend to forget the reason for the day and turn it into a recreational day with cookouts and fireworks. Neither are a bad thing, but we don’t stop to reflect on how important the Declaration of Independence was – not just to Americans, but to freedom-loving people all around the world. But that wasn’t why that piece was suddenly so popular. For those of you not in the know, today (August 15) is India Independence Day. Apparently the search bots didn’t know about other countries. So, people of India, sorry my piece wasn’t about that. However, I have placed links on this piece and the image above is of a favorite way of celebrating Independence Day there – flying kites! So, to my friends in India, Happy Independence Day! I hope you have a great day and that the weather is good for flying kites! And if you want to shoot off some fireworks, well…you go – after all, India and the USA both gained their independence from Great Britain!